A few weeks ago I was intrigued by a recipe for a variation of Shepherd’s Pie that a friend posted on Facebook. That version was definitely not low-carb, but I saw that it would be really easy to modify it to be “legal”, so I did and it was the kind of fantastic that makes you want to make another one right away. After my husband took the first bite he said, “There aren’t going to be any leftovers,” and he was right. It’s pretty easy to make, which is a huge bonus, and you could make this ahead of time to bake whenever you want. If you’d like leftovers, my advice is for you to make two. Combine the ground beef, onion, egg, Parmesan cheese, sage, and salt in a bowl and mix well, like you’re making meatballs. The best way I’ve found to do this is just to squish it all together with your fingers like it’s modeling clay. Note: The reason I say to use lean ground beef is not for any fear of calories or saturated fat. The more fat in your ground beef, the more it shrinks when it cooks and the more fat will run off it. You are using the beef as a crust in a pie plate where the grease will have no where to go. If you don’t use lean ground beef, your pie will shrink and be floating in a pool of grease, so for this purpose, leaner is better. Press the beef mixture out like a crust in a 2 qt pie plate, cake pan, or casserole dish. I used a 9″ round straight side pan and it was just right, but whatever shape you like is fine, as long as it holds about 2 qts. Break the cauliflower up into florets and steam until it’s very soft. Puree the cooked cauliflower with the cream cheese, and add salt, pepper, and garlic powder to taste. I recommend seasoning it like you would if you were just going to eat it as a side dish, and then add in a few more hearty shakes of garlic powder. Put the garlicky mashed cauliflower into your beefy crust, spread it out evenly, and then cover with the shredded cheese. The 1 1/2 cups measurement is just a guideline. Pile that cheesy goodness on pretty thick. Bake for 45 minutes at 350º, and then remove it from the oven. Even if you use lean ground beef, there will probably be some grease in the pan. If you carefully tip the pan, you can drain some of it off, but do not dump your filling out over the side! 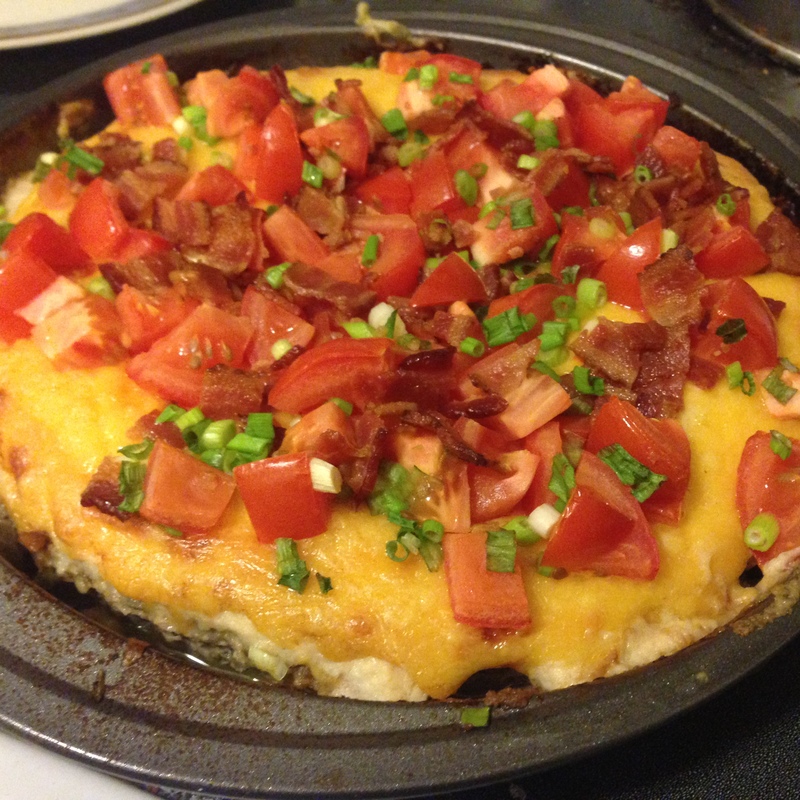 Top the pie with the tomato, bacon, and green onion and bake an additional 10 minutes. The last step is to enjoy it.